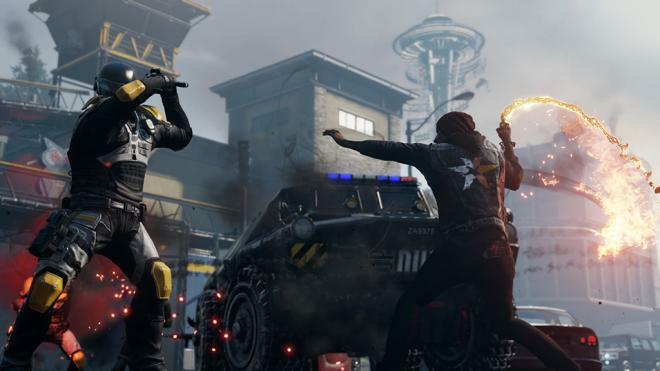 'Infamous: Second Son' is the latest release in the 'Infamous' franchise, a series that originally got its start on the PlayStation 3 about five years ago. Developed by the now Sony-owned Sucker Punch, the open world games allowed players to reach super-powered havoc on the PS3. 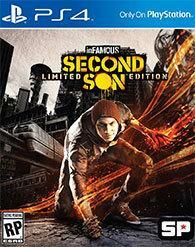 Come March 2014, and 'Infamous: Second Son' stands as the early PS4 title that can boast the most sizzle. The PS3 titles were big hits as they put players in the role of Cole McGarth. 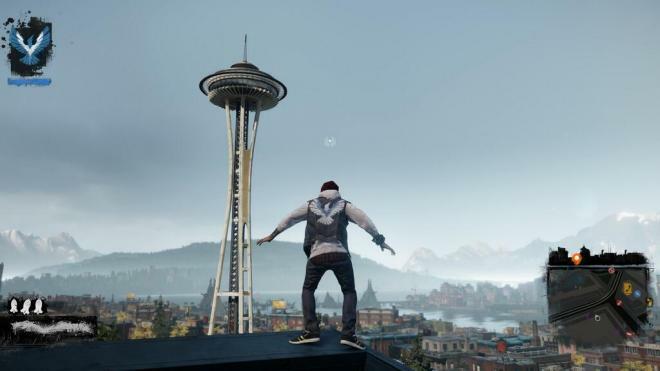 However, for 'Second Son,' Sucker Punch choose to break away from the story of Cole McGrath, whose story had been put to rest in 'Infamous 2,' and weave a different narrative about a conduit named Delsin Rowe. Picking up several years after McGrath's story, the U.S. government has set up a powerful organization called the Department of Unified Protection in order to hunt down and imprison all conduits. These conduits have been relabeled bio-terrorists as part of a unilateral policy designed to spread fear amid the general public. Despite their jack-booted nature, D.U.P. employs their own infusion of powers, and it's the regular citizens that are in danger whenever D.U.P. makes an appearance. Delsin, an Akomish native American and something of a screw-up, stumbles his way into discovering his inner-conduit powers after a chance run-in with another conduit early in the game. Of course, this also leads the Department of Unified Protection to Delsin's Akomish reservation and ultimately kicks off a mission to save the people of his tribe before it's too late. In addition, Delsin will come into contact with other conduits and try to free the stranglehold the Department of Unified Protection has on Seattle. It's a decent narrative that follows a fairly linear path, but it's definitely not successful at getting the player emotionally invested in the characters. Beyond Delsin's banter with his brother, there are a fair number of corny situations that will make you roll your eyes. 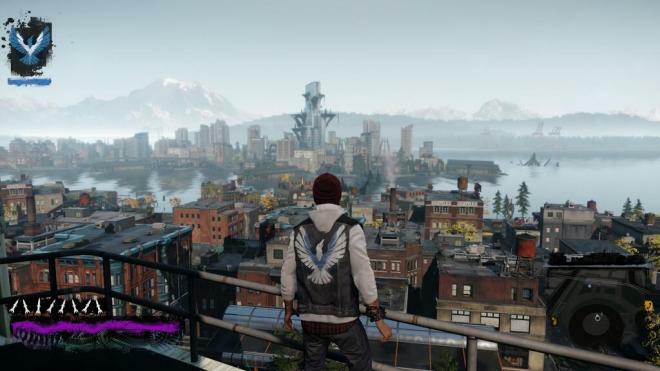 There's also a big disconnect between a specific event that happens toward the end of the game and Delsin's overall tone through the finale. Without giving away a plot point, Delsin's wisecracking attitude after that event seems incredibly out of place and works against the story direction that Sucker Punch chose to take. This wouldn't be an Infamous game without the return of the karma morality system of choices. And for the most part, it's remained unchanged. You have two choices, good or bad. There is no gray area. Sucker Punch also gently forces the player into a specific path for the entire game, mostly because unlocking specific abilities requires a specific level of good or bad karma. Good karma is tallied up during the game for actions that include incapacitating D.U.P. agents rather than killing them, taking down drug dealers in the area, freeing citizens imprisoned in small detention centers and choosing to help other conduits rather than condemning them. Alternatively, you could do the opposite- rack up a high kill count to gain bad karma while constantly admonishing the citizens of Seattle. To accomplish these feats, the player gets access to a variety of conduit powers related to smoke, neon lights, video games, and concrete. 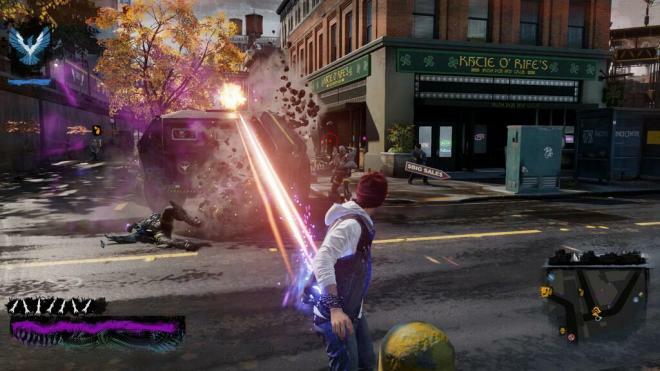 Each power has an original melee attack, a travel power, a rapid-fire low-power attack, a high-power missile attack and a devastating AOE attack that annihilates anything in Delsin's vicinity. Each power has specific strengths and players will likely gravitate to specific ones based off how they want to play. My favorite power was the neon ability, specifically because the long-range attacks were effective and the travel power is the fastest of the four when upgraded fully. Alternatively, the video game power is ideal for stealth players, concrete is useful when you want to tank your way through an area, and smoke has a good bit of area attacks that spread the damage around liberally. One annoying aspect of the combat system is that that player cannot switch abilities easily using the directional pad on the controller. The player has to actively seek out the element that's associated with the power to make the change. Players also have the ability to unlock new abilities within each power set as well as increase the strength of existing abilities. Some of these abilities are related to your karmic alignment, thus it's likely that several powers will stay locked unless you play through the game a second time. Abilities are unlocked by collecting blast shards spread throughout Seattle. Shards can be found powering flying drones, the fingerprint scanners at checkpoints around the city, and within the mobile command units that make up the heaviest areas of D.U.P. agents. In addition to collecting blast shards, there are a number of side tasks that can be accomplished to reduce the level of D.U.P. influence in each specific area of Seattle. These tasks include destroying cameras, finding and capturing undercover D.U.P. agents, spray painting anti-D.U.P. graffiti around the city and locating hidden audio files that expound on character backgrounds. After each one of these is completed, D.U.P. 's control of the given area is reduced by a correlative percentage. Once the percentage is low enough, Delsin can place a prank call to the D.U.P. hotline and drive the remaining enemies from the area after a large battle. This unlocks the ability to fast travel to different areas of the city, assuming you have at least two points on the map to travel between. I didn't find fast travel too much of a help for the story, but it could be useful when finishing off the remainder of side tasks to achieve a 100 percent rating in the game. The control scheme seems very well-thought out, except for the touchpad inclusions. It really takes the player out of the action when forced to perform an awkward gesture when spray-painting graffiti or when destroying the power supply in a mobile command unit. Thankfully, Sucker Punch doesn't make the player use the touchpad when fighting major boss battles. Visually, Sucker Punch has built a vibrant version of Seattle that's a breath of fresh air compared to the previous Infamous games. In addition, the large sandbox world runs smooth as silk and load times are at a minimum when quick traveling around the city. The physics engine is also very well designed making it easy for the player to zip around rooftops without worry. The frame rate is rock solid, ideal when taking on 10+ enemies at once. However, the most impressive aspect of the visuals has to be the lighting and particle effects when it comes to the powers. Sucker Punch did a fantastic job giving each ability a unique look. Character models are also quite detailed, but the facial animations during the cutscenes look just slightly off at times. They convey the emotion of the moment just fine, but there was something about the eyes that drove me nuts. 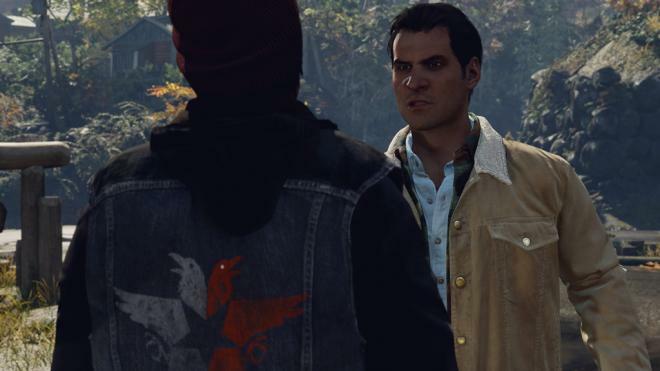 If you played 'The Last Of Us', you will immediately recognize the voice of Delsin Rowe. 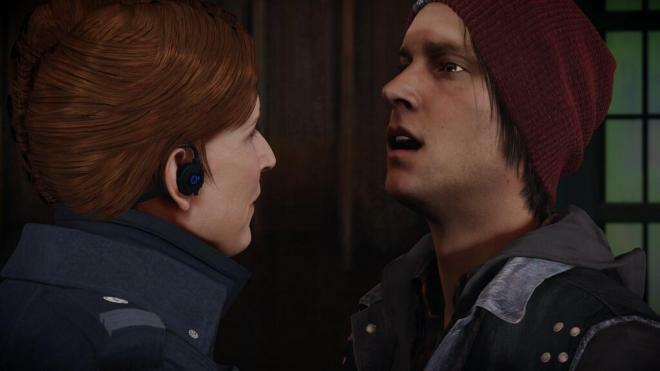 Troy Baker definitely does his best to bring the incorrigible Delsin to life, but it feels very awkward at times. Perhaps it's because Baker was phenomenal at 40-something Joel in 'The Last of Us' and voicing a 20-something teenage rebel seems a bit out of character. Interestingly, Travis Willingham's character, Reggie Rowe, was more believable and provided a much needed balance to Delsin. The voice work on the other characters is solid, but the script isn't fantastic. For any hearing impaired gamers that rely on subtitles, beware of an strange subtitle bug that overlaps text from the in-game news reports on television stations with text from someone that calls Delsin. The voice audio defaults to the most recent action, but the text starts to overlap lines from two different actions into one very confusing conversation. I noticed it when reading along with the subtitles a couple times. With four different sets of abilities to create, the sound effects team did an excellent job creating a unique set of sounds for each ability. Directional audio is also used extremely well in Second Son and that's vital when Delsin is swarmed by D.U.P. agents. It's also fun to hear the PS4 controller speaker play sounds like ringtones; it actually caught me a bit off guard in an entertaining way. In regards to the score for the game, it definitely sets the mood. However, there's nothing really memorable about it. You won't be humming anything after playing for a few hours. You are probably looking at about 10 to 12 hours to complete the game. On normal difficulty, I finished the main story at around 11 hours at a 72 percent completion rate. That included tracking down over 50 percent of the shards, destroying all mobile command units, destroying all cameras, locating all audio files and getting about 40 percent of the fast travel spots. I also upgraded the majority of my four abilities as well as the default melee ability. The good news is that Sucker Punch allows players to re-enter the game world after completing the final story mission. After the credits roll, you will be able to jump back into the game. If you are obsessive about completing games at 100 percent, there's definitely plenty to do. It's likely that it will take you an additional 3 to 4 hours to complete absolutely everything and drive the Department of Unified Protection out of Seattle. You can also play through the game a second time to choose the alternate path of morality, however be aware that Sucker Punch doesn't allow you to skip over any cutscenes. Be prepared to watch the same thing a second time. Sucker Punch has also included a side quest called "Paper Trail" that introduces a conduit with a paper power. I believe it's going to be some form of episodic content, but only the first mission is active at this time. There definitely feels like there's opportunity to create more downloadable content for 'Second Son', specifically to introduce new conduits into the game world. Depending on your perspective, the biggest strength or flaw of 'Infamous: Second Son' is that Sucker Punch doesn't evolve the series significantly. 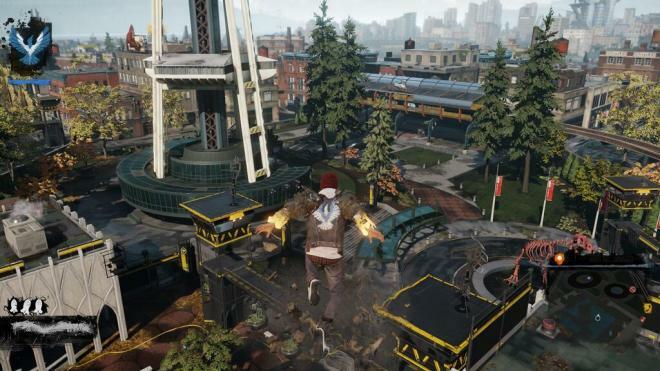 If you simply want more of the same, 'Infamous: Second Son' is definitely on par with the first two games in the series and is a solid adventure. If you were hoping that Sucker Punch built significantly on the sandbox world and offered up a bevy of new options like an advanced morality system or a number of branching story paths, you are going to be sorely disappointed. But overall, it's a fun ride and definitely a welcome addition for anyone transitioning from the PlayStation 3 to the PlayStation 4.